“Neris and India’s Idiot Proof Diet, How we lost ten stone” was written by two women who have had personal experience with dieting and weight loss and wanted to share what they learned with other dieters. At one stage they weighed 434 pounds between them and decided that enough was enough. The book outlines how the authors, Neris Thomas and India Knight lost around 10 stone (140lbs) between the two of them in one year by following a low carbohydrate diet that is very similar to the Atkins diet. Neris and India wanted a serious plan that was also flexible and allowed them to enjoy food that didn’t resemble regular diet food. They certainly didn’t want to feel hungry or deprived on their diet. It also was important to them that it was easy to fit their diet into their daily lifestyle. Initially the authors recommend that dieters write down the reasons why they want to lose weight as this will help to maintain motivation throughout the program. There are three phases to the diet with the first being a two-week introductory phase which is very low carb and resembles the induction phase of the Atkins diet. This phase is the most extreme and involves strictly limiting carbohydrates as well as caffeine. Following phase 1 dieters are allowed to introduce carbs gradually each week so that the plan then is closer in structure to the South Beach diet. In phase 2 dieters are permitted a carbohydrate allowance of 40-100 grams daily. In phase 3 dieters are allowed to continue to slowly add carbohydrates each week with the advice that if weight gain occurs then to slightly reduce carbohydrates again. Refined carbohydrates and sugars are to be strictly avoided in all phases of the diet. Dieters must eliminate bread, pasta, rice, potato and desserts. Meat, poultry, seafood, eggs, cheese, butter, cream, green vegetables, avocado, nuts, herb tea. Dieters are encouraged to increase their exercise to a minimum of 20 minutes per day. Walking is acceptable. 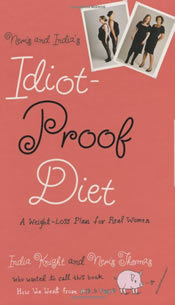 Neris and India’s Idiot Proof Diet book retails at $24.99. There is also a cookbook that is available for $29.95. If dieters purchase the recommended supplements this will be an additional expense. The weekly grocery bill is also likely to be higher due to the requirement to buy more high protein foods. Many readers will relate to the authors’ experiences and their honest account of their relationship with food. Addresses the psychological aspects of dieting and provides support to dieters as they explore the process. Gives dieters advice on how to maintain motivation with positive incentives when goals are adhered to. Easy to follow with familiar foods. Good for dieters who wish to lose weight quickly for an upcoming event. Online support forum with free access. May increase the weekly grocery costs, as high protein foods and fresh produce can be expensive. High protein diets can result in constipation due to an inadequate intake of fiber. The diet varies from the actual diet the authors used to achieve their substantial weight loss with the introductory phase lasting for six months rather than the 2 weeks recommended in the book. Some readers may find the authors’ extremely frank use of language offensive. Will probably not appeal to male dieters. Recommends eight nutritional supplements to be added to the diet. Promotes weight loss at a rapid rate that may be unhealthy. Risk of rebound weight gain when carbohydrates are reintroduced. As far as diet plans go this is nothing new, but rather a standard low carbohydrate and high protein dietary approach. The extreme restriction of carbohydrates is generally not necessary and eliminates the intake of many healthy foods such as fruits and whole grains that are an important source of nutrients including fiber in the diet. However, what makes this book unique and of value are the personal stories of the author’s and the emphasis on addressing the psychological aspects involved in weight loss with acknowledging how closely food intake is related to emotional well being. What is the nutritional values for a typical meal? REBECCA, I also would love to know what you have and i will be greatful if you share your information with me. I have composed a diet as such. I started with the 2 week, what I call detox, and then ate 6 small meals a day. After about 2 mos, you will only want 3 meals and no snacks as your stomach will shrink. Their food exclusions are right on. There are substitutes for potatoes and pasta especially. If anyone is interested in hearing my ideas, please email me at rebecca_sabin77@yahoo.com. And…I still ate chocolate…and pizza was ok one a month.